I am so glad I did not purchase 6-8 months supply of Bath and Body works from the US. Just few days before placing my order, after shortlisting my preferences; the news broke. What did I use before? I keep Lotus Herbals Licorice Bars, always stocked. I love the fragrance; mystically woody and induces a warm fuzziness in the bath. Aroma Magic Shower Gel, The Body Shop Vitamin E bars and Dove Cucumber and Green Tea Body wash for summers. The summer of 2015 had to face a wind of change, I decided never to return back to Dove Cucumber and Green Tea Body wash. The simple reason: Unilever is testing on animals as and whenever required by law. (sic). I was contemplating to purchase The Nature's Co Spearmint Body Wash, but then I had not used them before. So I comfortably chose The Body Shop over The Nature's Co. But then I am going to purchase it now after I am done with The Body Shop Shower Gel. The Body Shop is Cruelty-Free even when the Parent company, L'Oréal continues to tests on animals. With all the thoughts running amok in varied directions and with opinions, I decided to take a standpoint for myself whether to support or boycott The Body Shop. With the meagerness of Cruelty-Free Cosmetics in India, I decided to prioritise with respect to their parent companies. For instance: A is Cruelty-Free but with a non-cruelty free parent company while B is Cruelty-Free and Independent. I will always choose B over A. A will always have the last priority will be singled out only if I find no replacements. Here is what they replied to me about my letter to them. Greetings from The Body Shop India. Here at The Body Shop we've always been passionately against animal testing. It means that none of our products has been tested on animals. 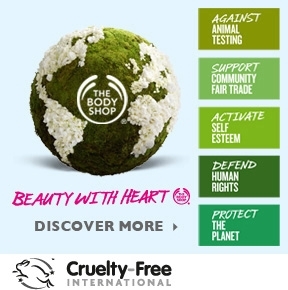 All The Body Shop® products are certified by Cruelty Free International as meeting their Humane Cosmetics Standard. We comply with the very strict requirements of the Humane Cosmetics Standard. This standard is set by the British Union for the Abolition of Vivisection (BUAV) and is regarded as the highest standard for animal welfare in the cosmetics industry. Today, under the name of Cruelty Free International, they audit us regularly to ensure we comply. We also audit ourselves. Every two years we check our policies and compliances to ensure we're adhering to the latest animal-welfare guidelines. So there are other Cruelty-Free brands I am waiting to get back from. The list of all with their respective replies will be added to the list. If you love The Body Shop, you can read this write to them. Even though it mentions for Europe, a little change in the world could actually prove beneficial overall.